BuildYourCNC Announces Financing Options Now Available BuildYourCNC is now offering financing options for machine purchases. Read more. Our CNC Router and Laser on Love Yurts Did you see it? If you look closely in their workshop, you can see our greenBull CNC Router/Laser in Nathan's and Jennifer's workshop on the Love Yurts TV show. Love Yurts is a series on the DIY Network that showcases Nathan and Jennifer's company Ohana Yurts. They trusted us to make them a CNC router that also has a Laser for the work they do on the Love Yurts TV show and professionally. Read more. Jonathan Mocan greenBull 4X CNC Router and His Beautiful Work Check out Jonathan's greenBull CNC router and some of the work he does with it. Truly incredible! Read more. Vertical Laser XL Cutting Acrylic We went live on Facebook with the test cut of the Vertical Laser XL. Our customer Christopher requested a demo of the machine to cut out some very fine-quality acrylic parts. Read more. Howard Royster's Telescope Mount Howard managed to learn the principles of CNC motion electronics and adapt them to build a very impressive telescope mount. The structural parts you see in the video were constructed on Howard's custom-built CNC which he sourced from BuildYourCNC. This is an excellent example of scientific prototyping and we are thrilled that Howard took the time to write to us and share his project. Here is the summary of the project in Howard's words. Read more. Rick Hebert's greenBull 6X CNC machine kit One of the joys of being in the business that we’re in is seeing how our machines have helped people save time and money. BuildYourCNC’s goal has always been to provide affordable digital fabrication tools to people who need them. We recently made a visit to Rick Hebert in Lake Charles, Louisiana to see his machine and how he uses it to grow his business. Read more. BuildYourCNC at Houston Mini Maker Faire 2015 We attended Houston Mini Maker Faire for the 2nd year in a row this past November 14th at the George R Brown convention center in Houston. The venue was about twice as big as last year as the show continues to grow exponentially. Read more. Jason Q's blackTooth is groovy baby! Jason recently purchased his blackTooth laser engraver and clearly he isn't the type of guy who just puts something together without tricking it out a little (or a lot). Read more. Press Release: BuildYourCNC Announces New Vertically-Oriented Laser Engraving Machine BuildYourCNC is pleased to announce the new Vertical Laser XL: 4x8 80W CO2 Laser Engraver. Read more. Press Release: BuildYourCNC announces greenBull 4X: 4' x 8' routing area CNC Kit with laser capability BuildYourCNC is pleased to announce the new greenBull 4X: the first 4'x8' CNC kit to feature dual laser/CNC capability. Read more. Lawrence M's Scratch Build CNC with Revamped Dust Collection System Lawrence has had a scratch built CNC machine for a while now and recently shared some of the modifications and upgrades he made to the machine including new linear rail and a new dust collection system. Read more. 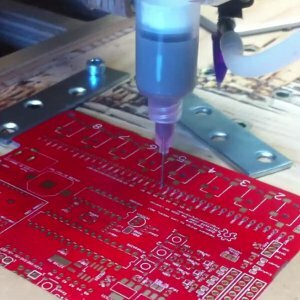 BuildYourCNC visits Proto Makerspace One of the most important things we do at BuildYourCNC is supporting our local makers and the maker community in general. We recently took some time to visit Proto Makerspace located in Spring Texas, (a northern suburb of Houston) and chat with the founders Evaristo Ramos, Andrew Toler, and Nancy Ramos. They gave us a tour of their place and showed us some of the cool things they keep around for their members to tinker with. Read more. BuildYourCNC's Scrap Becomes Communities' Treasure We recently were faced with a dilemma on how to dispose of our scrap MDO. With the amount of scrap coming in on a weekly basis, storage kept filling up quickly and disposal costs were becoming an issue. So we decided to try a new approach: donate it! We posted an advertisement and soon several people started inquiring about coming by to collect our scrap wood that was just taking up space. Since that time, our bins have been a lot emptier and the happy people have been emailing us to show us some of the things they’ve been making with it. Read more. Important Update for ArtCAM 2013 Users An essential hotfix for ArtCAM 2013.SP3 (build 298) has been released to resolve an issue with calculating Area Clearance toolpaths. Read more. BuildYourCNC at Houston Mini Maker Faire 2014 We had the pleasure of attending the Houston Mini Maker Faire this past November 1st, 2014. The show was overall a hit and we enjoyed being a part of it and showcasing a few of our machines. Read more. Children's Museum of Houston's blackFoot 4x8 and redLeaf We recently paid a visit to Chad Gehring over at the Children's Museum to check on how his blackFoot 4x8 build was going. Watch the video to see Chad's machine and how he was able to mount his redLeaf. Read more. New 3D printing algorithms speed production, reduce waste Purdue University researchers have developed two software algorithms for trimming time and material, reducing 3D-printing time by up to 30 percent and the amount of support material by up to 65 percent. The new PackMerger algorithm works by printing a project in segments that can fit into the printing tray and later be glued together. Read more. Dave Hair's Casserole Carrier made with the blackToe CNC Router Dave Hair shows off another creation made with his modified version of the blackToe 2x4. This time he's made an adjustable casserole carrier that is both simple to make and quite practical. Read more. Dave Hair's Stunning Champagne Table made with the blackToe CNC Router Dave used a modified version of the blackToe 2x4 to create this art gallery-worthy champagne table. Read more. Steve Hobley and his Companion Cube Another fine example from Steve Hobley using his blackToe CNC and a laser cutter very similar to the blackTooth (which he also created using his blackToe CNC). A companion Cube from the video game portal. Read more. 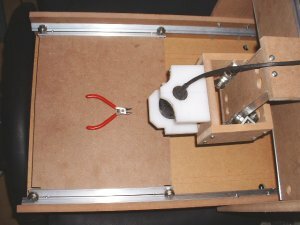 Make Article: CNC Machining vs 3D Printing Makezine.com has an article about CNC machining vs 3D printing that features an excerpt about BuildYourCNC's DIY CNC machine. Read more. April Fooled: Evil Mad Scientist's Marshmallow-Toaster Bot Leaves Consumers Roasted Evil Mad Scientist launched a tantalizing new product this April 1st. The notorious launch date was sure to raise suspicions, but the content and accompanying video found here were so well presented that many potential customers may have been left disappointed when they tried to actually purchase this marshmallow machine masterpiece. Read more. New Research and Development Section Check out the new Research and Development section. We need your feedback and suggestions!! You can now request new R&D projects, or products you would like to see us offer on the website. You can also vote on these projects or products so they can be ranked in the order of their popularity. Read more. Printable Electronics Two recent developments are getting us very close to printing electronics, one using inkjet printers to print conductive material for electronics and photonics and another, a conductive ink to create flexible electronics for books, displays and wearables. Read more. 3D Printed Optics I came across a rather interesting idea while checking out Disney's Research Hub: Printed Optics. They seem to be quite interested in fabrication and 3D printing as a good majority of their videos pertain to this type of subject matter. More interestingly, they have devised a way to print objects that embed optical characteristics so that light traverses where they intend to create some very interesting effects. Read more. Education Resources If you are involved with education whether it is vocational, high school, elementary, university, or anything else related to education in the tech and fabrication industry we offer special pricing for educators. Read more. New Vertical Oriented CNC Machine Coming soon!! This is a first look at the new vertical CNC machine that we will soon offer. This is a result of customers looking for a smaller footprint, but still wanting the full 4 feet by 8 feet cutting area. The machine will be called the greenLean. Read more. Katy Makerspace blackToe Build Part 1 We're proud to be affiliated with the Katy Makerspace. We recently provided them with a blackToe for their members to use. In this first part we'll be examining how they went about organizing parts for the initial build, as well as constructing the table. Read more. 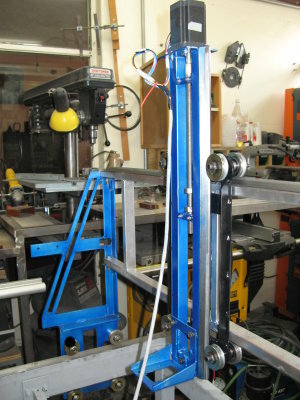 A Belt and Pulley on the X-Axis by Jerry D. When Jerry was faced with a problem of not having drivers with enough current to drive the x-axis of his blackFoot. Jerry had the HobbyCNC 3/4 axis driver board, but the drivers are underpowered for this machine, so Jerry think of an alternative to purchasing new drivers, he solves the problem mechanically. Read more. Website Changes We listened to your comments and feedback and made a few changes to the site. Gone are the need for shipping quotes, and all of the shopping is contained within the site (no more PayPal shopping cart) for a more focused and dynamic experience. If there are other features you would like to see, please let us know! Read more. Evaristo R and his blackTooth Modifications Evaristo purchased one of our blackTooth laser cutters and he added a modification that I believe to be quite useful. The blackTooth comes with a potentiometer to control the intensity of the laser, but Evaristo wanted to add a device to be able to see the measure of this intensity level. Read more. Dustan Webb's Laser Cutter and Engraver Update: Check out Dustans new glass etching. Dustan sent a few images of new things he is cutting and engraving using his blackTooth Laser Cutter and Engraver. The examples he is showing are 3D puzzles of a fly and a dragon. He also produced some functional boxes (with lids that open and close) with designs engraved on the top of the boxes. Also, check out the new paint on his machine. He decided to paint his machine bright red with black edges. Read more. blackTooth Laser Cutter/Engraver First Cuts/Engravings The feedback is coming in from the first customers that purchased the blackTooth laser cutter and engraver. I will post these first cuts and engravings on this page. If you have a new blackTooth laser system, please send us a video of your machine in action. If you have a tip to share, include that information as well. Read more. Lawrence M's Table Bed Support Lawrence built the scratch build CNC machine from the book and he came up with a very nice addition to the underside of the table that provides extra support so the table will not sag over time. Read more. William L's Scratch Built CNC Machine Here is a scratch built machine (from the plans or book) that exhibits great workmanship, but more importantly, how some of the construction of the CNC machine was done. William L. used sound techniques to make sure the machine would be constructed as intended, knowing that some of the machine would have various size differences within the sub assemblies that would make some of the measurements within the plans not work. Read more. Sam S. and His Hacked redFrog When I said you can hack the redFrog, I wasn't kidding. Read more. 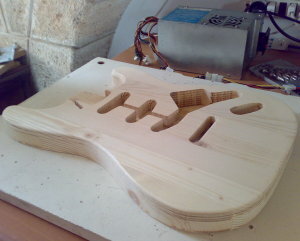 Mike M's Great Examples of Guitar Showcases CNC Machines are not only used for making the guitars! What about the cases in which they are stored, or showcased? Mike has done an excellent job creating intricate cases with glass fronts. But, you wouldn't put just any guitar in these cases. You would want the prized guitars in these cases. Just look at the detail that Mike put into this work using his blackToe CNC Machine. Read more. WikiHouse, the Ultimate Example of CNC Use If there was an example on how a CNC could be applied that I would be most excited about, it would be the WikiHouse. 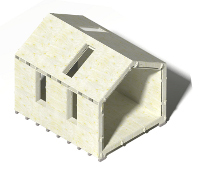 The WikiHouse effort is spearheaded by Alastair Parvin which talks about these efforts on TED "Architecture for everyone, by anyone". Read more. 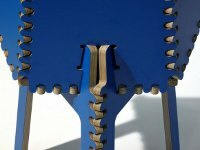 CNC Panel Joinery from Make: Here's a really useful article on CNC panel joinery methods by Make:.. Read more. Jack Rehak's Inspiring Build Meet Mr. Rehak, an 80 year old (2012) bright CNC Machine enthusiast. Jack built his blackFoot CNC machine in short time considering his available resources. Jack's modifications to his blackFoot are quite inspirational and worth a look. Moreover, Jack has set-up a very inventive workspace and resources to handle the various tasks such as loading sheets, hose/cable management and means of control. Read more. HTH Media Arts Engineering The HTH Media Arts Engineering is not only a great resource for innovative projects, a great educational institution for technology and creative thinking, but they purchased my blackToe 4'x8' CNC Machine Kit. The projects that these students complete range from rapid prototyping machines to job specific robitics. The students have done an impressive job with this machine. The breadth of projects that the students are working on is quite incredible and I urge anyone to go take a look at their website. The school purchased the CNC Machine kit as a students project, but also to serve as a workhorse and resource for students for their project needs. Read more. Mark K's CNC Machine A quote from Mark, "You have really given me a lot of confidence with your web site and your book to help me build my CNC. I never dreamed I could afford to have one let alone build it myself. I am actually a shop (industrial tech) teacher and have built it for use in our shop. I am very excited to see what I and my students can do with it. I also wanted to point out that in you book you said you wanted to present the material at a level that an 8th grade student could understand. I definitely think that I could help students build a CNC machine using your book and videos as a reference if I were allowed to hand pick the students. you have done an excellent job explaining, demonstrating and providing sources for parts." Read more. Steve Hobley's Fabrications Using the blackToe CNC Machine Steve Hobley has done many projects using his blackToe Machine, including a Theremin Stand and a spectacular wooden geared clock. Read more. Clint Ws CNC Machine Clint W added a webcam to his blackToe CNC Machine and made some interesting modifications. Ok, so first, I must say, the webcam on the machine is so cool. I have a desire to put a webcam on my machine for monitoring purposes. You never know what will happen while the machine is running by itself. Things like, a piece popping out and getting stuck between the router and the table can happen every now and then. A camera, mounted near or on the machine is always a good idea, especially if you can see the video stream from another computer. Read more. Mark Gottschalk's 2'x8' blackToe CNC Machine Mark Gottschalk has a blackToe CNC Machine, but not any blackToe, his is 8 feet long! He makes these beautiful fish with this machine, so beautiful that he decided to establish a Kickstarter project in their honor. Read more. Roy Aylett's blueChick CNC Machine From Roy's excitement of finishing the build of his blueChick CNC machine, he submitted a few photos and a video to share. Roy added an nice little enhancement to the CNC machine, enclosed the electronics with a thoughtful layout, and adapted a smaller router within the provided mounts. Read more. Rahim Akbar's CNC Machine, Huge Panels and Other Examples Rahim uses his blackFoot 4'x8' machine to make much larger masterpieces. Check out his Islamic inspired panels that he installs all over the world. Read more. 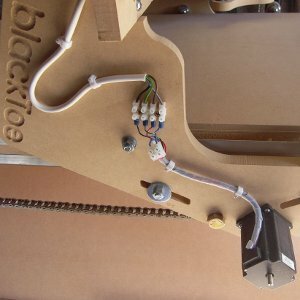 Ronald L's CNC Machine Kit Build Ronald's blackToe CNC Router is exhibited for the exceptional wiring work he has done and for a particular challenge he needed to overcome. First, a word about the challenge. Ronald's motors that he purchased contained shafts in a metric size and currently, my collars for the drive sprockets are sized for imperial shafts of 1/4" diameter. His shafts were a little too large and, upon my recommendation, he bored a larger hole. Unfortunately, the bore did not center properly and he is faced with a need to purchase collars for the motors shafts locally. When he overcomes this challenge, I will add more information. Read more. Build Progress by Walter D. As Walter D builds his CNC machine, he's thinking about under the machine and where to house the electronics. the wiring and workmanship is done well. Read more. Steve Hobley's Fabrications Using the blackToe CNC Machine_copy Forget about sharks with frikin' lasers attached to their heads, put one on a blackToe. Well, blackToe CNC Machine, at least. The very active Stephen Hobley is attaching his laser on his blackToe. So, why not increase your breadth of fabrication and add a laser to your CNC machine? 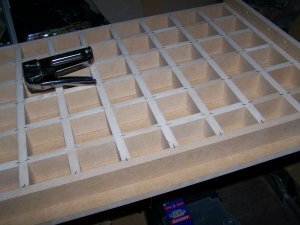 Check out his blog on his build progress. Read more. Duncan's PCB (Printed Circuit Board) Milled by the blackToe CNC Machine This is probably the best PCB I have seen routed on a CNC machine and it was completed on a blackToe CNC machine made by Duncan. Read more. Toby V's CNC Machine and Process Here is another excellent example of a customer putting together a CNC machine kit and revising/adding to fit his needs. 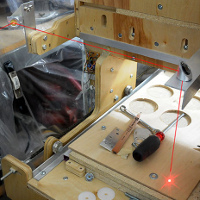 Specifically, this is the blackToe version 4.0 CNC machine kit, put together by Toby, a Neuroscience Ph.D with a post Doctorate at Harvard focusing on electrophysiology of the biological neural network in the retna. He used this knowledge to create computational models of artificial neural networks to test new hypothesis. Now, he is mainly focusing on the business aspect with his current occupation and spending time at home with woodworking. With his knowledge and willingness to delve into the CNC world with my kit, I was, obviously overjoyed, at the opportunity to get feedback and see what additions and modifications he would make to the machine. Read more. 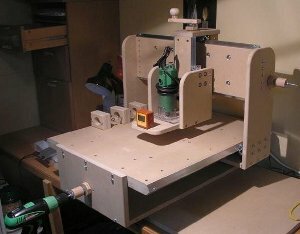 Alden G's CNC Machine and Narrative I have seen many builds based on the step-by-step instructions on this site, but when I see the the DIY community start to mix the ideas of one CNC machine with another, I get really excited. To take a machine and introduce concepts from another machine, like timing belt mechanics, is clever and welcome. Alden also is very creative with where he positions the drivers. Read more. John S.C.'s CNC Machine and Suggestions John S.C. did something that I have not yet seen. 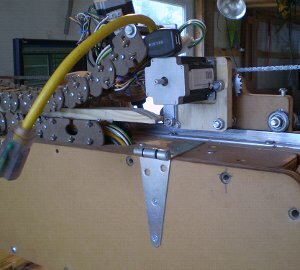 He applied a ball-screw to the DIY version of the CNC Machine found on the step by step and the book "Build Your Own CNC Machine". Yes, you heard me right! A ball-screw. Why do I sound excited? Read on. Read more. Greg C's Machine and Example Greg has produced an excellent CNC machine. This can be seen through the example that he provided me. Greg produced the machine "by the book", as they say. This demonstrates that the book readers are starting to enjoy their machines. This is an exciting time!! I received the pictures of this machine on February 17th, 2009. Read more. Octavio's Metal CNC Machine Octavio went out on a limb and created a metal machine with some very inventive components. Inspired by this website, he was able to get this design and construction going. The machine is truly an example of using components in the machine for efficiency and simplicity. The overall structure appears to be steel. He uses bearings with channels to serve as linear guides. The z-axis mechanism is reversed to enable longer travel. All of this is not the most interesting part. Octavio is a medical doctor. This goes to show that individuals of all backgrounds dabble with this technology. Take a close look at the bearings used to guide along the rail (U groove and V groove bearings work well for this type of linear rail mechanism). I know, you're saying that this method is used on other CNC machines. Sure, but he is positioning the bearings and using minimum hardware to serve multiple purposes. You can see that he is using the same shaft for each pair of bearings. The back bearings (the bearings to the right) glide horizontally along the y-axis and the front bearings serve the z-axis up and down movement. This linear motion mechanics for the y and z axes is very clever. Octavio is currently trying to reduce the gantry weight. He says that the z-axis alone is 50 pounds. He has a goal of 20 pounds by changing the metal to aluminum using stamped parts. Read more. Chris Cockrum's CNC Control When I look for content to add to this website, I look for content that will ultimately benefit the users of this site with additional information. With the various control methods that Chris brings to the table, I am overjoyed to add his methods to this website. Chris implements a simple and effective Z-axis homing plate, router control and some fine examples. Read more. Alessandro's CNC Machine Build with Guitar Example I have gotten a lot of requests asking, can this machine make a guitar? 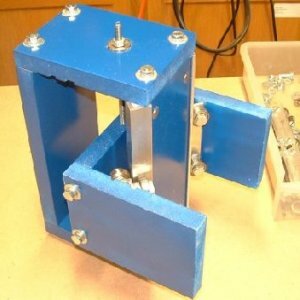 Alessandro created a 2nd generation CNC machine using this website as a guide and from the images he provided, I can say he was quite successful. Not only that, he also built his electronics from scratch and his wire management is absolutely fantastic. Read more. 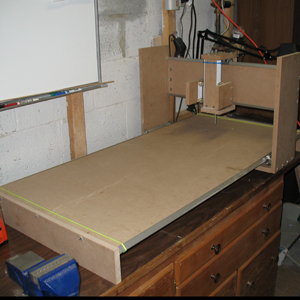 Dave C.'s CNC Router It's a good time to update on another builder. 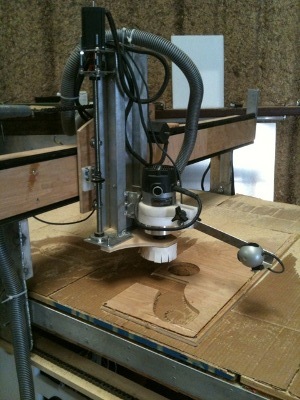 Dave C. is building his CNC Router with patience and method. He is equipped with some nice tools to make sure the form and mechanics are perfect. When he first told me he was working with these power tools, I was very jealous and I wanted some fancy power tools for myself. Read more. Lucan's CNC Router I was doing my usual research around the net, you know... to pass some time very late at night, and I came across a member of cnczone.com building one of Joe's CNC machines, and to my surprise, he was using the design from this site. I was very proud to say the least. This CNC router is setup very nicely, with a vacuum attachment and a few other interesting modifications. Lucan has also been cutting out an enormous amount of parts on this machine. He is in real production. Read more. Jacob R.'s CNC Router When I started this website, I though maybe I would get a few building this machine, and to the tee. My intention was to make it so that they can provide their own alterations and sizes. With Jacob's machine, the intent lives up to it's promise. I think, if we take all of the great enhancements from all of the builders you see on the list, we would have an even better machine. Jacob did similar enhancements to the bed of the machine, reinforcing it so it would not sag, but he did not stop there. This guy is a true modder. He salvaged a component from his router to serve as a clamp. He also enhanced the lead screw nut adapting a flange to secure to the transfer piece. He has also selflessly provided an AutoCAD file to share with this community (with double rail x-axis modification). Read more. Builder's Spotlight: Jim S. I would like to exhibit another build being completed by a dedicated viewer of this website. Jim S. emailed me in the infancy of this website and said he was interested in building the CNC. We have been emailing back and forth on various topics, which in turn gave me a good source of information for the website. Jim S.'s machine is looking really nice. He is currently up to the wiring of his stepper motors to his driver. Read more. 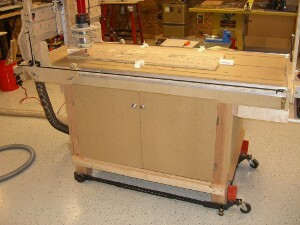 Mick H's CNC Router Build Mr. Mick H. He has been following the build and making great progress. He, just like the other fellow builders have added their own enhancements, which really makes them leaders in building these CNC machines. He noticed that the table, at the sixe of 24" x 48" will deflect a little as the gantry reaches the mid point of the table. He took his reinforcement to another level, shall we say he "spiced it up a bit". He also went the gluing route, as opposed to a mechanical fastened build. With his clean and precise workmanship, as noted in the images, it is a very smart way to go. Remember, if gluing is a consideration, your measurements will need to be somewhat precise to insure a tight fit around the rails. Read more. David K's Build of a CNC PCB Mill When my fingers were dying from extreme metal ring strangulation from those $1 folding scissors, kind Mr. David K. came to the rescue and sent me a beautiful pair of side clips. Well, he's been hard at work building himself one of these CNC gizmos. Read more. CNC Router Demonstration 1: Engraving the P.COC Logo You've got to be asking yourself, what is a P.COC logo? First of all, P.COC stands for Project for Complete Open CNC, and it also sounds like Peacock (the bird with beautiful feathers that open up, get it??). The graphical part of the logo uses a screw as the body of the bird and nuts to symbolize the feathers. My wife thinks it looks like the sun and I should lose the screw. The logo symbolizes the philosophy behind all that I do here, volunteer my time to show how to build a completely open source CNC routing machine. I have also designed a logo to be cut out on the CNC Router, and how cool would it be to initiate my demonstrations with that logo. Read more.